A Russian cargo vessel, the MV Amurskaya, went missing on Sunday in the Sea of Okhotsk. Vessel’s cargo was 700 tons of gold ore. The vessel was en route from the port Kiran to the port of Okhotsk and the number of onboard vessel is supposed to be 9 crew member although in other media reports there were 11 crew members. An emergency beacon sent a call of distress on 27 Octrober at 08:15 a.m. Moscow time (05:15 GMT) near the Shantar islands in the southwestern portion of the Sea of Okhotsk. The tanker Novik, which arrived at the scene of the beacon’s distress call, did not discover the vessel. The Novik, accompanied by an amphibious Beriev Be-200 aircraft, continue the search operation, which is complicated by stormy weather conditions. According to Maritime Bulletin the distance between last known position and alleged position of EPIRB is a small one, vessel could drift to EPIRB position even being under way, because disabled or under way, vessel was apparently drifting, trying to hold on against waves and wind. The area of possible disaster is restricted and not too big, search and rescue operations are complicated by a storm and very low visibility, but if vessel isn’t found in 48 hours, she may be considered as sank. Loose cargo which shifted in stormy weather may have sunk the MV Amurskaya that disappeared in rough seas in the Far East on Oct 28. Bad weather is making difficult the rescue operations. The Russian Union of Seamen rejected the idea that the MV Amurskay, might have been the target of foul play because of its cargo, since one ton of mineral ore contains two to several hundred grams of pure gold. Despite all efforts, no traces of the missing ship or its crew have been found yet. The past few days rescue teams have discovered what may prove to be the hull of the Russian bulk carrier which went missing in the Sea of Okhotsk a week ago. The echo depth sounder detected that some object is lying at the depth of 25 meters. The divers have yet to examine the object. Divers are expected to start an operation on Monday 5 November 2012 to check the location of the missing dry cargo ship freighter Amurskaya. According to the Moscow times, the owner of the missing Amurskaya freighter has been arrested on suspicion of negligence leading to multiple deaths. The manager is expected to be charged with violations of maritime safety rules leading to two or more deaths. The charges carry a sentence of up to seven years in jail. According to ITAR-Tass news agency the MV Amurskaya was found by divers in about 75 meters (230 feet) of water on Wednesday. According to The Moscow Times rescuers found an empty life raft in the area where the Amurskaya cargo ship sunk off Russia’s far eastern seaboard. 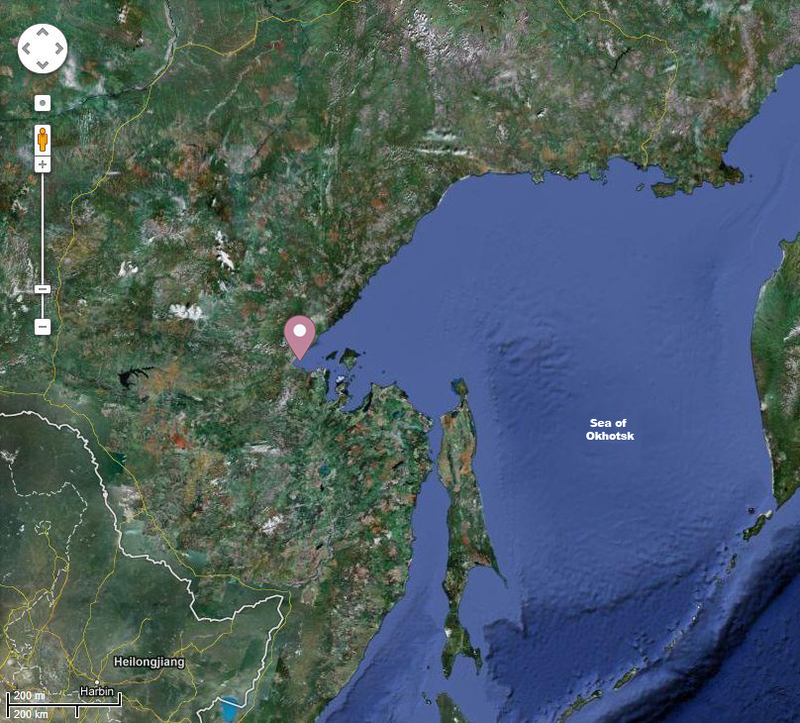 A search team found the 20-person raft at 10:12 a.m. local time near Feklistov Island in the Sea of Okhotsk, the Transportation Ministry said in a statement Thursday. The raft was practically deflated, torn in places, and was filled with pebbles and sand, but no people were found inside, this makes it even less likely that any of the Amurskaya’s missing crew members will be found alive. Russian rescue divers discovered the body of a dead man in the wreckage of a sunken cargo vessel. Divers found the body during their fourth dive into the wreckage and investigators will attempt to determine the cause of death.